This beautiful ballad was penned by Gloria Estefan herself and released in March 1988. Lifted from the album "Let It Loose" the single initially failed to make much impact in the UK and Europe, although reached #1 in the U.S. on the Billboard Hot 100 for two weeks. A re-release in July 1988 entered the UK charts at #87, taking twelve weeks to reach its peak position of #10 in September 1988. The track was the breakthrough Gloria needed after previous singles had failed to chart highly. Subsequently, many singles which had previously charted well in the U.S. were also re-released in the UK (including "1-2-3" and "Rhythm Is Gonna Get You") and became major hits. 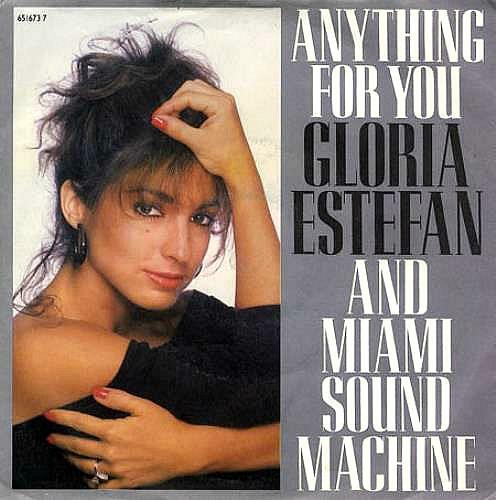 "Anything For You" was produced by Gloria's Cuban-American husband Emilio who she married in 1978. They are still together. The B-side featured a Spanglish (Spanish and English) version of the A-side entitled "No Te Olvidare". As well as being released on traditional vinyl, the single was also released on 3" CD, maxi CD and Cassette. I remember that these formats were became popular during the late 80s. For the 3 inch CD, you had to buy an adaptor ring to enable it to play. The video features Gloria singing in a night-time street setting mixed with imagery of what appears to be her younger self with an old flame. 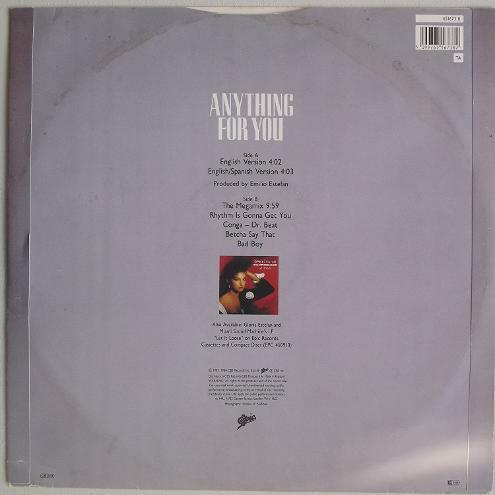 The 12" vinyl single included both the English and Spanglish versions of "Anything For You" on the A-side. The B-side featured "The Megamix" (9:59) which was a mix of the songs "Rhythm Is Gonna Get You", "Conga - Dr. Beat", "Betcha Say That" and "Bad Boy". Originally released on June 2nd 1987 as "Let It Loose", the album title was changed to "Anything For You" for its re-release in 1988 in the UK, Europe and South Africa, although not in North America.